I hope you keep them as a item. when I need a special gift for someone, I'll order this item. 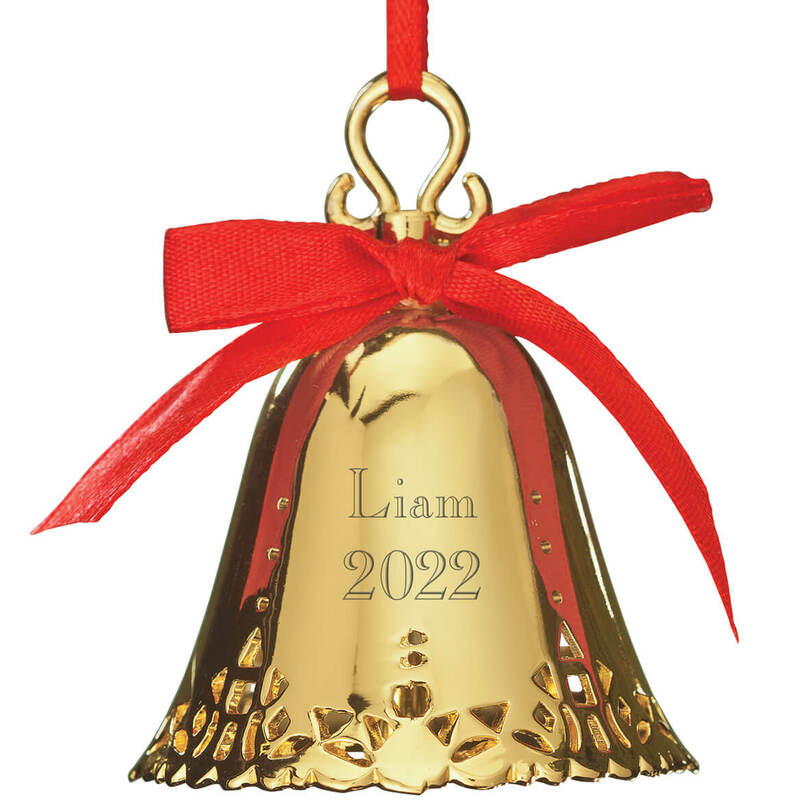 Each new baby in our family gets a personalized ornament. It's well made, too. Great gift for children & grandchildren at Christmas! My granddaughter loved it & so did I!!! 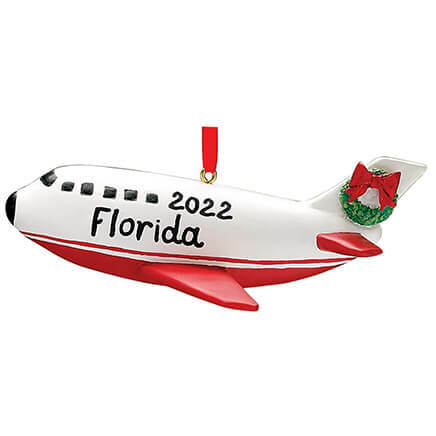 I love this ornament, it is a true keepsake. Everyone who has seen it thinks I must have spent a fortune. It is so adorable, and I love that it can be personalized. It would be nice to choose the font, but the font used looks nicer in person than in the photo. 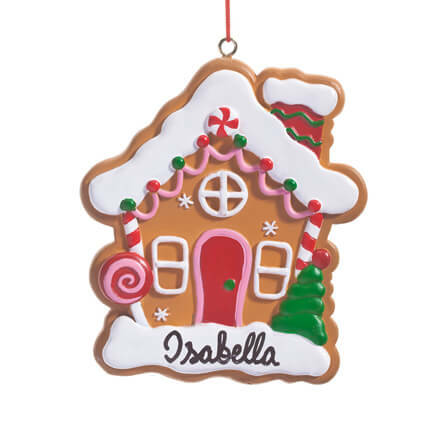 This ornament is not too heavy for the tree, and you don't have to worry about breaking it. I have purchased this product year after year and have always been impressed with the quality and the price. This is a gift for children that will follow them throughout their lifetime. My granddaughter and I pray together before bed when she stays with me. 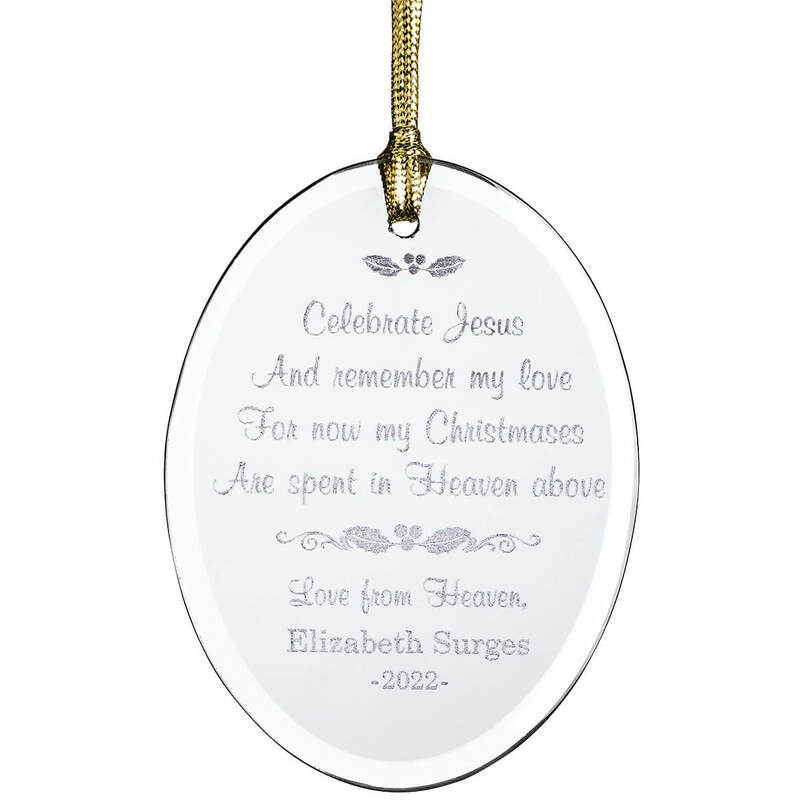 This ornament made me think of that and will remind her of her special times with her grandmother. Hopefully she'll keep the ornament into adulthood. It is durable enough to do so. I ordered one boy ornament and one girl ornament. The nameplates had to be glued on when we got them. Other than that they look nice and I think they are pretty and adorable. Reasonable price and good quality, the engraving is nice. cute, but not appropriate for older children. Did not notice the bare bottems. Wanted to give to my nine year old grandchildren, but too young looking because of that feature. 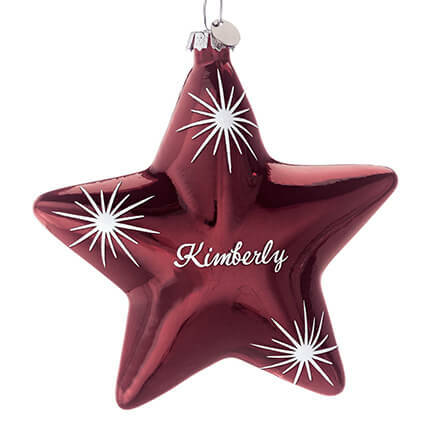 My mother in law who has since passed away purchased these exact ornaments for our oldest children. She was never able to purchase one for our youngest daughter before she passed away. Our youngest daughter cried last year because she was the only one who didn’t have one. This year there will be no crying! I HAVE ONE OF THESE FOR ALL MY GRANDKIDS ! I have all my children and grandchildren this was for a great' granddaughter, and they are very nice! 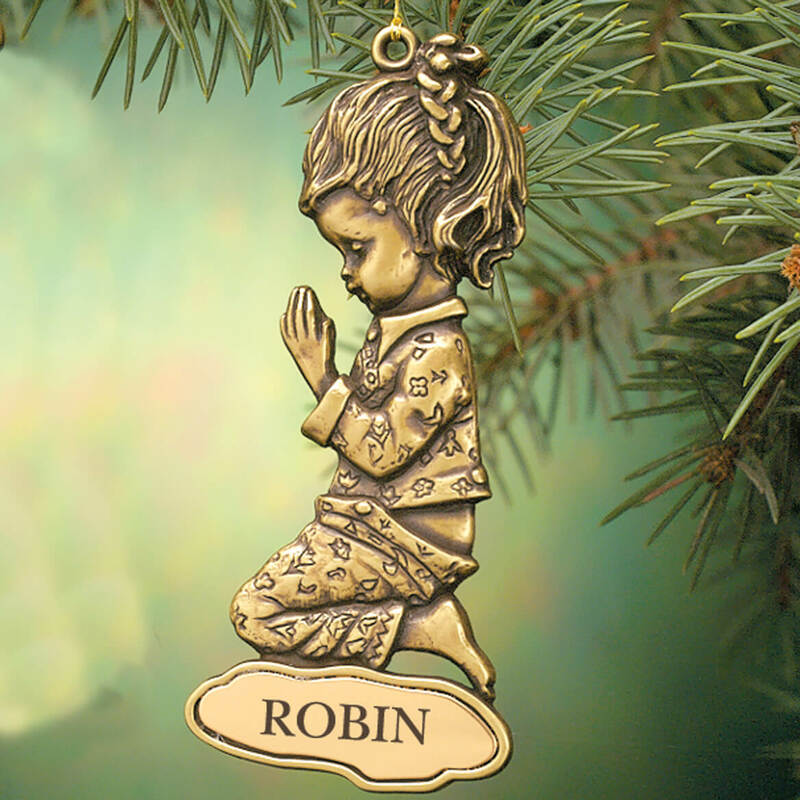 Adorable praying girl ornament for my precious granddaughter! I chose this for my daughter-in-law who is beginning now to want to attend church regularly. tradition. everyone in my family has one with their name on it. they are hard to find in recent years. we have a new edition to the family this year. My children had these when they were little and I want my grandchildren to have one too. my mom started these as a grandchild tradition. needed one like the others for my 8th grandchild. This is for our newborn niece. I had ordered two back in the 70's wanted a new one. Miles Kimball has provided engraved ornaments for all our children and now for our grandchildren. They are a cherished tradition! I give one to each new baby at church each year. Good quality. Sweet and simple for my granddaughter's first Christmas. I chose this item for a little boy's Christmas tree. He will enjoy seeing his name and the kneeling child: he just got baptized. For my granddaughter. For Christmas each yr. I get them an ornament for the tree. I forgot to order for one great grandchild at Christmas. The other ones I ordered were very nice. It matches the ornaments already have for granddaughters. I have ordered from Miles Kimball for 50 years so they must be doing something right. I'm giving it to a little girl. She will be able to use it for a long time. when will bronze praying girl be available? BEST ANSWER: Thank you for your question. 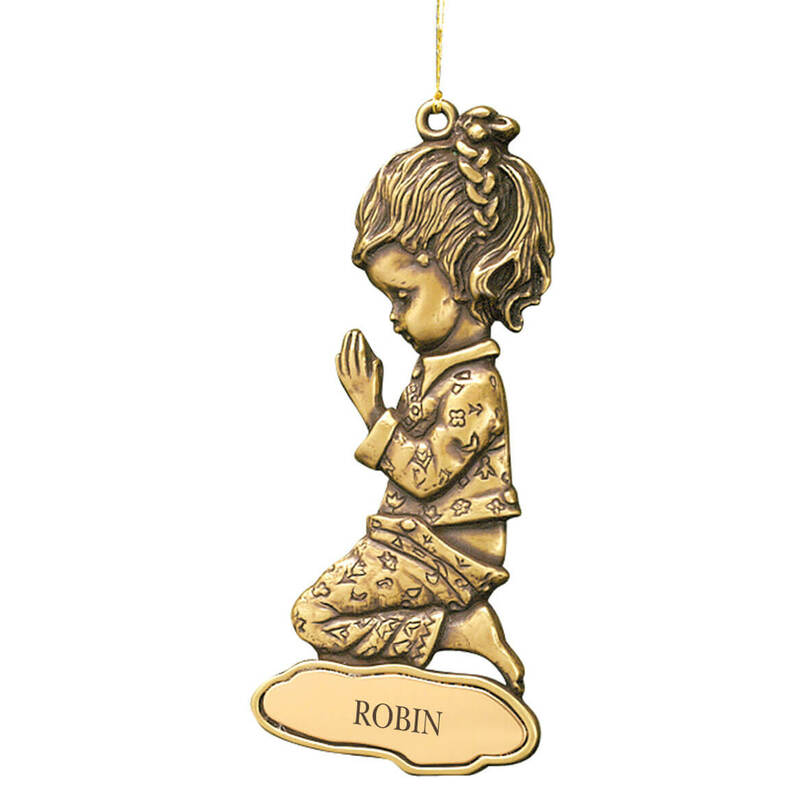 Unfortunately the bronze girl ornament has sold out. We no longer have inventory and are not expecting further shipments from the supplier. We hope this information will be of help to you.